How pretty are these colorful party string lights? They'd make a great decorative statement for your summer backyard parties or even bring a dash of summer happy vibes into your interiors. 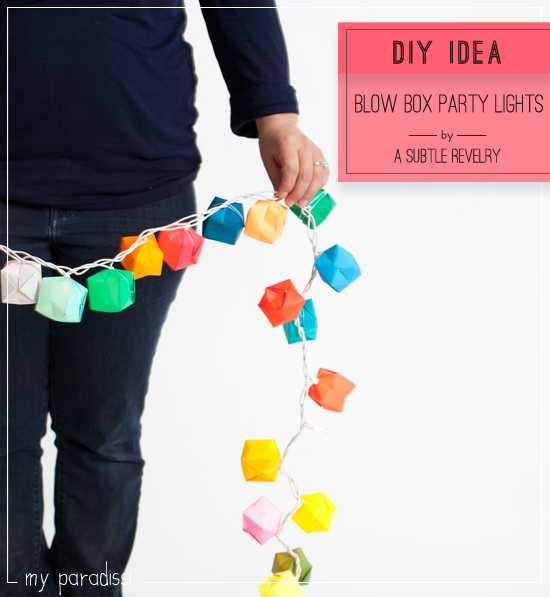 All you need is a standard string of fairy lights and some colored papers of your choice to make the origami blow boxes. See detailed instructions at A Subtle Revelry. P.s. A colorful diy floor mat and a colorful diy cord pendant. 2 comments on "DIY: Blow box party lights"
Cute! I love this idea, and I've totally made those origami globes before. They're not hard!